Apple has reinvigorated its phablet without rewriting the playbook thanks to its smart 3D Touch technology and a more power under the hood. It's not the upgrade some will have been hoping for, but it's the upgrade we've got. 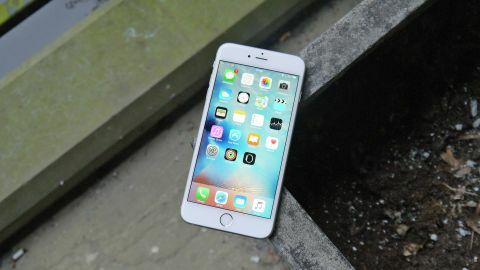 Update: Apple has confirmed the iPhone 6S Plus will get an upgrade to its new operating system - iOS 11 - later this year, bringing with it a host of new features to reinvigorate the phablet. In 2014 Apple finally gave us an iPhone which offered a display to rival its Android flagship counterparts, while enabling you to really take advantage of the apps, games, movies and TV shows in its expansive libraries. The iPhone 6 Plus was expensive, but there's no denying it was well received. Android fans will continue to berate Apple for its seemingly copycat 'innovation', but the plain fact is that the 6 Plus was a great handset, with all the power of the iPhone and a much longer battery life. It's no surprise then, that Apple returned in 2015 with the refreshed iPhone 6S Plus, and then followed its phablet line up again in 2016 with the iPhone 7 Plus. While it may no longer be top-dog in Apple's line up, the Cupertino firm has confirmed it will bring the iOS 11 update to the handset, meaning it's still a more than viable option for those looking for a new phone. As you've probably guessed from the 'S' handle in its name, the 6S Plus is more of an incremental upgrade over the 6 Plus rather than a re-imagining of Apple's smartphone range. It might be a stretch for current 6 Plus incumbents to justify upgrading to the new iPhone 6S Plus, but it's got a few fancy features you won't find on older iPhones. The iPhone 6S Plus inherited the price tag of its predecessor, but since the arrival of its successor - the 7 Plus - Apple has not only cut the price, but also removed the 16GB and 64GB models entirely. Apple has introduced a new storage option though, with a 32GB model now lining up alongside the 128GB 6S Plus. The 32GB variant will set you back $649 (£599, AU$1,079) - which is cheaper than the launch price for the now discontinued 16GB phone. Unsurprisingly that put the 6S Plus up against top phones, rubbing shoulders with the Samsung Galaxy S6 Edge, Galaxy Note 5, LG G5, OnePlus 3 and Sony Xperia Z5 Premium. There's no mistaking the incremental credentials of the iPhone 6S Plus when it comes to design. It looks identical to the iPhone 6 Plus, and I mean identical. Remember the iPhone 4 and 4S? It's like that. In fact, the only obvious marking that differentiates the 6S Plus is the small 'S' logo on the rear below the word 'iPhone' – although it will be covered by your hand 90% of the time (or 100% of the time by a case). The sleek, rounded metal body continues to look and feel premium, with the build quality you'd expect from Apple. After last year's unfortunate 'bendgate' fiasco, Apple has looked to reassure people that its latest smartphone duo are tough. This isn't strictly necessary, given that we'd have expected last year's models to be strong enough to get through a couple of years of use, but some clarification was needed. Both the iPhone 6S and 6S Plus sport what Apple is calling '7000 series aluminum', which it claims is a lot stronger. Who wants to volunteer up their new iPhone 6S Plus for a bend test? The 6S Plus is still a beast in the hand, with Apple's insistence on the sizeable bezels above and below the display ensuring its supersized dimensions. The 6S Plus is ever so slightly thicker than its predecessor, gaining an additional 0.2mm in girth. You won't notice the addition, and I suspect Apple needed a little extra space to squeeze in its 3D Touch technology. It's also piled on the pounds, gaining 20g on the 6 Plus, which sees the iPhone 6S Plus tip the scales at a hefty 192g. It's fair to say, then, that you'll notice the 6S Plus in your hand and pocket, and it can get a little tiring on the wrist to hold it for extended periods one-handed. Most of the time I found I had to employ both mitts to keep it steady and reach all areas of the screen. The flat rear and rounded metal edges offer little in the way of grip, which makes the iPhone 6S Plus a bit of a slippery eel. A tight grasp is required to ensure it doesn't make a dash for the floor, although Apple's silicon case provides both protection and in-hand security for $39 / £29 / AU$59. Apple's stuck with the same button placements too, with power/lock on the right and the volume keys on the left, just below the mute switch. During one-handed use I found I needed to stretch a little to reach them, and those with smaller palms will struggle more. There is a silver (actually, pink) lining though: the iPhone 6S Plus has a new color! In addition to gold, silver and space grey you can now pick up Apple's latest supersized smartphone in a fetching shade of 'Rose Gold'... also known as pink. The familiar design of the iPhone 6S Plus will be comforting to the Apple faithful, while outsiders may look on with raised eyebrows, mumbling something about a lack of progression from the Cupertino firm. And they may have a point. On first viewing the screen on the iPhone 6S Plus is the same as its predecessor, with the 5.5-inch panel sporting a full HD resolution and 401ppi pixel density. That makes it sharper than the smaller iPhone 6S, which only musters a 1334 x 750 resolution, resulting in 326ppi. It's not perfect, and there were still times I had to give it a quick wipe, but compared to many of its Android rivals the iPhone 6S Plus is less of a smudge magnet. As I've mentioned, hold the iPhone 6S Plus side by side to the iPhone 6 Plus and there are no visible differences between the two, but the 6S Plus has a hidden bonus feature: 3D Touch.